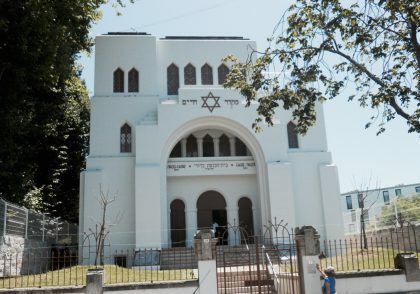 The name of the synagogue in Porto, Kadoorie, evokes the international reach of the Portuguese-Jewish community. Kadoorie is the name of a Portuguese-Jewish family that took English nationality and settled in Shanghai. Its members generously subsidized the construction of this fine monument with the help of the Portuguese communities in Lisbon, London, and Amsterdam in 1936. The synagogue has a capacity of 300 and offers all that is needed for religious service. It is to a large extent the work of Captain Barros Bastos, who tried to bring the region’s crypto-Jews back to the faith of their ancestors. Raised in a Christian family in Porto, Barros Bastos rediscovered Judaism when he visited a synagogue in Lisbon. After his conversion in Tangier, he married a young Jewish woman. He traveled tirelessly around the villages of the Porto region, speaking to the crypto-Jewish inhabitants and inspiring them with his fervent call to courageously and openly affirm their Judaism after centuries of secrecy. He was particularly concerned with providing a Jewish education to children, seeing this as the only way of rejuvenating the old communities. To this end he set up a teaching college in Porto. He had many ennemies in the Salazarist movement, however, and, when false charges were leveled against him, he was condemned and stripped of his rank in 1938. He died in poverty in 1961. Portugal rehabilitated him in 1997, officially acknowledging his innocence and tireless devotion.